This is a variation on our Tomato Onion Quiche. It is a gorgeous addition to any Thanksgiving table with orange hues from the pumpkin and flecks of green from the pepitas. 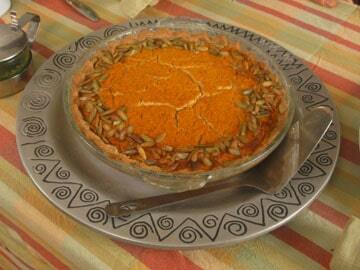 The pumpkin seed crust is so flavorful and free of oil, butter or margarine. 1 12-16 ounce package Tofu (firm tofu will give a chewy texture and rustic look to the pie, silken soft tofu will be more custard-like. Drain and rinse pumpkin seeds. Place in a food processor and pulse several times to start forming a paste. Add a 1/4 cup of water and pulse several more times. Scrape down the sides of the bowl. Add another 1/4 cup water and start to blend seeds. The goal is to make a paste with the least amount of water possible. Add water as necessary to enable blending, about 1 cup total. In a small bowl mix together flour with xanthan gum. Add to food processor and blend until mixture clumps into a bowl. Remove from processor and place in a small bowl. Knead slightly and press into a bowl. Dough will be moist and sticky. Cover with wax paper and let chill at least an hour. Remove from refrigerator. Place dough on a piece of wax paper at least 12 inches in length. If the dough is too sticky you may dust your hands and the wax paper with more flour. Press dough into a flat circle and cover with another sheet of wax paper. Roll out with a rolling out to a circle as large as the pie plate you will be using. Carefully peel off the top sheet of wax paper. Don’t worry if the dough tears. You can easily just press it into the pie plate where needed. Turn the dough onto the pie plate, pressing it to match the plate form. Carefully and slowly remove the top sheet of wax paper. Trim edges. Set aside. In a large frying pan, turn heat to medium. Add oil and saute onions until transparent and lightly browned, stirring occasionally. Remove from heat. Blend onions, tomato, tofu, pumpkin and cashews in a food processor. Start by pulsing, then once everything is mixed, puree until smooth. Add salt, pepper, sage, onion and garlic powders. Pour over crust. Garnish top with pumpkin seeds. Bake at 375F for 40 minutes or until filling is firm and crust is nicely browned. If the edges start to brown before the filling is done, cover the top with foil.